There are many ways to help support the New Phil. As with all orchestras across America, ticket sales only cover less than 40% of our expenses. Our donors and corporate sponsors are a vital part of our organization! We are truly grateful for each and every gift and would welcome you as a donor to our organization. The New Philharmonia is a tax-exempt 501(c)(3) organization and your donation to the New Phil is fully deductible as allowed by law. All donations are acknowledged and included in our program books for one year. A special fund to help ensure the future of the New Phil, established in 2015 by the Knudsen family, in honor of founding New Phil Music Director, Ron Knudsen. Make your donation special for you. The New Philharmonia is grateful to its many friends who annually make special donations to the orchestra in honor of friends, special occasions and in memory of loved ones. 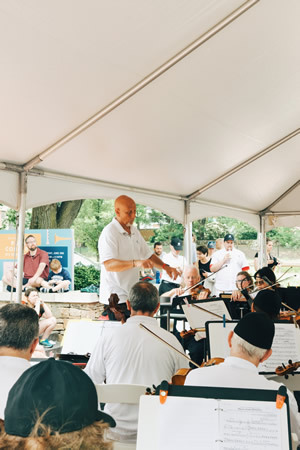 Many of our friends appreciate the opportunity to give to the orchestra on a monthly, quarterly or yearly basis by having their donation processed automatically from their bank account or credit card. For more information on this program please contact New Philharmonia Executive Director, Adrienne Hartzell Knudsen at adrienneh@newphil.org.